I'm still working on those Denali Posts. I'm halfway through processing the photos for a post on Denali wildflowers, but I've been a bit sidetracked by the deadlines for two photo contests I wanted to enter. However, I'm back on the job. Until that post is ready, here are some more shots from Denali. 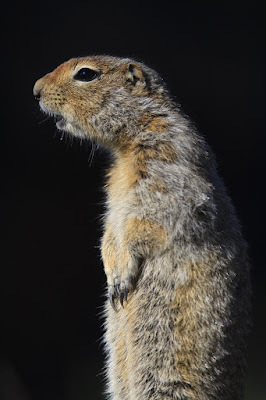 The arctic ground squirrel is a fascinating, if ubiquitous, animal in the park and I'll post more on them later. This little one hangs around the Eielson Visitor Center (an amazing environment-friendly wilderness visitor center about 2/3 of the way into the park and the turnaround point for many of the shuttle buses). Unfortunately, it was pretty habituated to people and has probably been fed in the past and takes advantage of scraps left by tourists who can't seem to read the million and a half signs about keeping the wildlife wild. At least it was alarm calling at the presence of people, before running over their toes. The male willow ptarmigan was making his way to the roadside for an early morning dust bath. I'm not sure if he was calling in response to the bus or some other stimulus, but he began calling as soon as we pulled over to the side of the road. 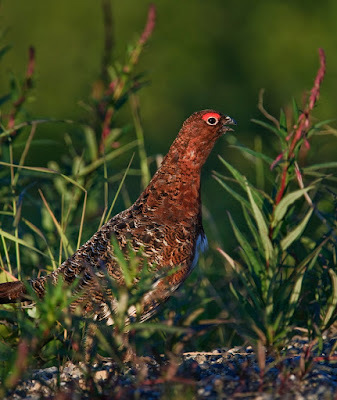 Very cool vocalization, visit this website (http://www.nature.nps.gov/naturalsounds/Sounds/Ptarmigan_Podcast_final.wav) for an example of ptarmigan calls. Interestingly, the woman interviewed in this podcast, Carol McIntyre, banded raptors for many years at Cape May, NJ before I interned there and she is friends with Katy Duffy the director of the owl banding project. This is the male willow ptarmigan's summer plumage. In the winter they turn almost pure white to blend in with the snow. 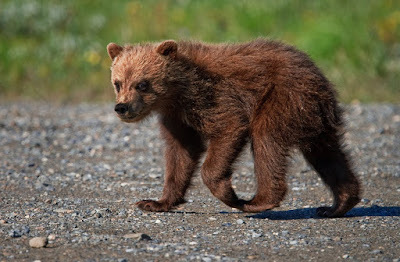 The final picture is of a grizzly cub that walked down to and across the road with its mom and sibling right in front of the bus in Thorofare Pass (just about where Little Stony Creek crosses the road). The spring cubs (born in January or February while the sows are hibernating) are dark brown (unlike the adults and yearling cubs which are blond), so this one is probably only about 4-6 months old.